IBM has extended its longstanding association with Wimbledon with an iPad app and added social sentiment analysis to SlamTracker, its "Grand Slam" points database. 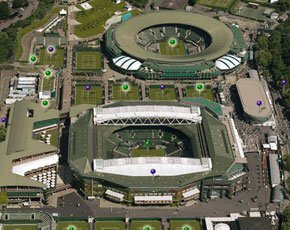 Sam Seddon, client and programme executive for Wimbledon at IBM, said the iPad app is aimed at offering deeper insight into the matches. He said the app provides total, immersive experience of the competition, as the user consumes post-match analysis, including statistical analysis, before going to bed. Mick Desmond, commercial director of the All England Lawn Tennis Club that stages the tournament, said the tie-up with IBM was important to extending the Wimbledon brand. “If you can't come to Wimbledon, we want to try to make it the next best experience,” he said. Drones were used before the tournament to take videos giving a bird's eye-view of the courts. India, China and Brazil are strategic markets for Wimbledon, and the e-commerce opportunities for selling items like the iconic towel are significant, he said. Social sentiment analysis, using IBM content analytics software, is also new for 2013, so for example the user can gauge how popular Andy Murray is in different parts of the UK. Last year, said Seddon, there were in the order of 100 tweets per second during the men’s final, won by Roger Federer against Murray, who triumphed over his Swiss opponent at the London Olympics the following month. The Wimbledon iPad app is available for download, and IBM said it offers an “immersive experience with media rich content that showcases our IBM MobileFirst and Smarter Analytics capabilities in a fantastic way”. The launch video shows the app’s capabilities. The iPad app complements Wimbledon.com, which last year had 16.9 million unique users and 400 million page views. A mobile app was released two years ago, and had 1.5 million downloads in 2012. Years of historical Grand Slam data, amounting to millions of competitive points, are analysed to identify key aspects of players’ performance when they played at their best. IBM has extended SlamTracker to rugby, in the work it has done with the Rugby Football Union. There, the supplier’s predictive analytics team has been mining data from rugby matches to see if it can devise a formula that enables it to forecast the outcome of a game. Matin Jouzdani, head of sports analytics, IBM, said that “real time insight from huge amounts of data” is what SlamTracker instantiates. Although there is no directly similar IBM product available for business, the same principle applies in corporate IT, he said. IBM piloted player movement tracking, using its Second Sight technology in 2011. The technology has been used to track missiles, but at Wimbledon it measures player speed, distance and stamina. It is similar to the Prozone technology that football clubs use to track players. This year it will be integrated with HawkEye, the ball-tracking and line-calling technology that was first used in tennis in 2002, in the BBC’s coverage of the Davis Cup. Wimbledon was the first Grand Slam to use the system, across four courts.